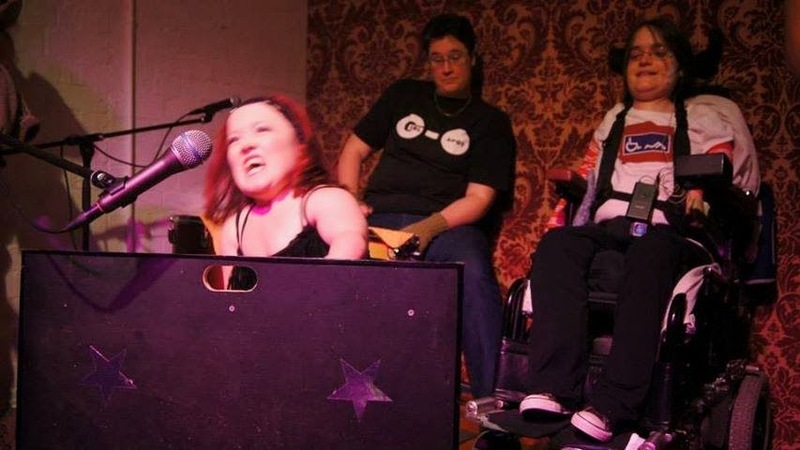 Real Women - A Celebration of Female Performers with Disability. International Women's Day is upon us, and what better way to celebrate than by watching a bunch of feisty crip chicks strut their stuff? We'll be performing with Stella Young, Eva Sifis, Emma J Hawkins (pictured below), Jax Jacki Brown, Anna Seymour, Zhen Chew and lots more. Tickets are selling fast so make sure you get in early. Where: The Victoria Room, Queen Victoria Women's Centre 210 Lonsdale Street, Melbourne. Cost: Full $15, Concession/Group $10, VIP (with complimentary drink) $20. Access: Wheelchair accessible and Auslan interpreted. Emma J Hawkins performs while Anthea and Jess look on.